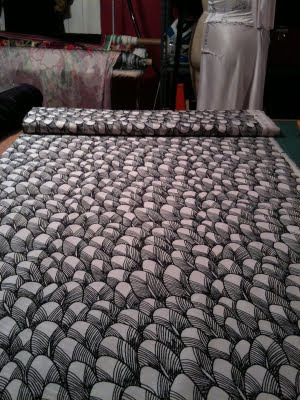 My fabrics have started coming in!! It's an incredibly complex formula because I'm buying job lots from wholesalers, which means I can only buy however many yards exist. Sometimes it's a few 100 yards, and sometimes, like in the case of this amazing Italian cotton feather print, it's only about 5 yards - enough for 1, maybe 2 dresses. Isn't it gorgeous? I love how organic the pattern is; how it looks like both anemone and a George Grosz pen and ink drawing at the same time. Swoon! What that means for Cabiria and my customers is unique and special - some of the pieces we'll create will be only a few of a kind, or maybe one of a kind. The style and size will be standardized for the line, but the fabrics - oh, the gorgeous fabrics - will be very rare indeed. How cool is that?